The goal of the School Drone Program is to educate future generations to operate drones safely and to arm them with the knowledge and understanding of aviation guidelines, and the rules and regulations specific to drone operations. The Ripper Aviation Academy is a CASA-approved drone and RPAS training organisation. We are able to tailor a drone training package to suit your school community that includes teacher and student training. As part of our ongoing commitment to the community, the Ripper Group has commenced a School Drone Program© within the Ripper Aviation Academy. The School Drone Program is specifically tailored to various levels, and runs courses in schools for both primary and secondary students, ranging from Drone Fundamentals through to Drone Advanced. Contact us if you’d like to introduce a drone training course into your school’s program. Certificate courses emphasise the safety and social responsibilities of a drone operator. Senior students will learn how drone technology is being applied across a multitude of industries. This will provide future study opportunities, with Southern Cross University and other universities, for students to apply this new technology in their chosen careers. There is also the opportunity for senior students to complete a Certificate III in Aviation together with a Civil Aviation Safety Authority (CASA) Remotely Piloted Aircraft (RPA) Licence (RePL). These courses are designed to be fun and cover everything a young pilot needs to know to fly drones safely, including the key rules and regulations with an emphasis on social responsibilities when flying. TSS robotics and engineering technology teacher Mark Lockett said TSS was one of the few schools in Australia to include drone pilot training in the curriculum. 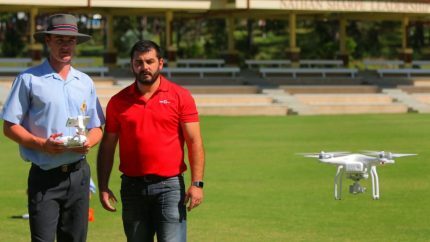 While Mr Lockett would teach students the practicalities of drone piloting, the CASA exams would be assessed by Westpac Little Ripper Lifesaver. ‘We’ve embedded the remote drone pilot’s licence into our Year 12 engineering and technology course,’ he said. Even if there was not a huge market for professional drone pilots, Mr Lockett said the technology would become increasingly invasive in many industries. ‘Within the next five to six years, most jobs will involve some kind of drones,’ he said. ‘You could take the example of a plumber. The forecast is, every plumber will have a drone flying over the top of a roof and they use infrared sensing and see where the leak is in the roof or out in the garden. That included parcel deliveries, damage and risk assessment and as-yet unthought of applications.